Glitchtown » Archive » Now, where’s my rimshot? Goddammit, Isaac just messed up another EPIC joke. This could’ve been one of the funniest strips ever, or at least second to funniest – and then he goes and does something like that. It would’ve been really funny because Leslie’s in a freezer, taking it cool. That was the joke. He’s taking it COOL in the FREEZER. That’s the funny. That you missed out on. Just add a rimshot and you’ve got great comedy. Isaac just doesn’t get that. This entry was posted on Monday, June 22nd, 2009 at 6:00 am and is filed under Comic. You can follow any responses to this entry through the RSS 2.0 feed. Both comments and pings are currently closed. I got you a present. But I ated it. u ated my present? U make me a sad Rasmus indeed. Haha, thanks Jon! 😀 I think we’ve all got more or less juvenile humor, if we’re honest. But the strip is freaking awesome and I love the fact that more and more new stuff (new techniques and such) is coming through the strip. They are! 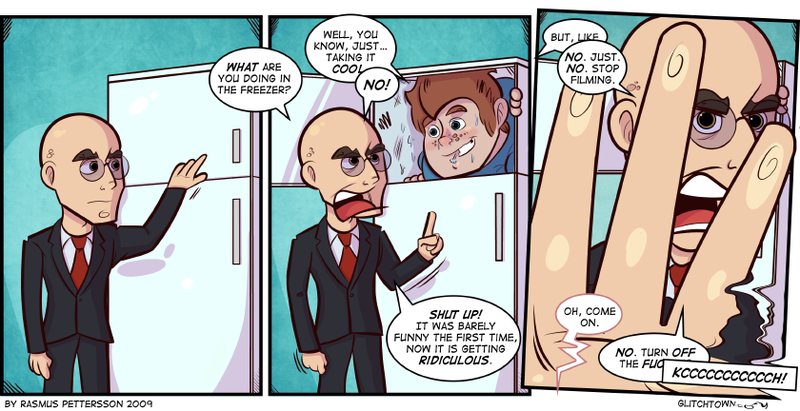 @Jarmo, I think the lines in the last panel are edgy because he’s breaking the camera. I’m not sure what you’re talking about Jarmo… 😛 It looks like it always does. alltid lika kul med randoms! Älskar random humor, vilket säkert är uppenbart.